In her official twitter handle Anushka Sharma shared her second look from her upcoming film 'Pari'. The look is as haunting as the first look. In this look Anushka Sharma is seen lying on the floor below the window curtains and has her ear-phones plugged in. She is wearing a normal salwar suit but the first reaction of anybody seeing this would be awe-struck. It’s so intimidatingly haunting. The tweet also announces the release date of 'Pari' which is February 09 next year. 'Pari' will also feature the famous Bengali actor Parambrata Chatterjee, who rose to fame when he starred opposite Vidya Balan in 'Kahaani' in 2012. 'Pari' is an upcoming production under Anushka Sharma and her brother Karnesh Sharma’s Clean Slate Films, along with KiriArj Entertainment. According to the Times of India, Anushka Sharma can be quoted- "We have gone by instinct in choosing good cinema, and the audiences have liked both our films. 'Pari' is a strong, engaging story and our team is brilliant. It's the kind of project that I love producing and delivering to audiences." Karnesh Sharma had recently said- "The film is on floors now and we are looking forward to a memorable shoot." 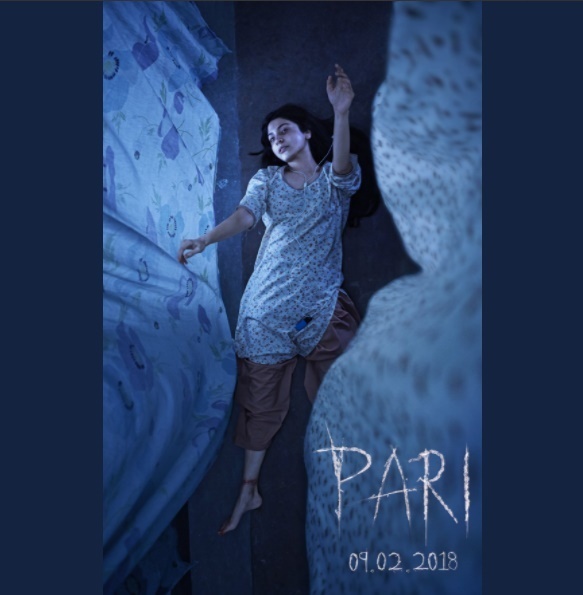 Prernaa Arora of KiriArj Entertainment was quoted saying- "Pari is a fantastic story. It promises an intriguing and engaging cinematic experience for the audience. We are very excited for this collaboration with Clean Slate Films and are certain that the content we create will further the reputation of our young companies and stand out from the crowd." After 'NH10' and 'Phillauri', this would be Anushka Sharma’s third film as a producer under her own banner. It is ironic that in her last film 'Phillauri' she played a friendly ghost and 'Pari' seems all haunting and intriguing. On the work front, Anushka Sharma is all busy promoting her upcoming film 'Jab Harry Met Sejal' with Shah Rukh Khan which is slated to release on August 04. It has been directed by Imtiaz Ali.